Assessed Value Pricing Strategies that Work. Listen in today. Jack Butala: Assessed Value Pricing Strategies that Work. Leave us your feedback for this podcast on iTunes and get the free ebook at landacademy.com, you don’t even have to read it. Thanks for listening. Jill DeWit: Jill DeWit with Jack Butala here. Jill DeWit: Welcome to our show. 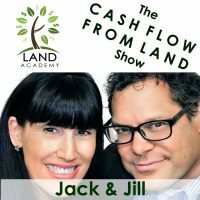 In today’s episode, Jack and I talk about assessed value pricing strategies that work. This is really a show for Jack, so that’s why I am taking the lead. This is going to be fun. Jack Butala: I love when you MC. Jack Butala: All I have to do is all the content. That’s more fun for me. Jill DeWit: That’s just kind of. Just sit back and relax. It’s good. First, let’s take a question posted by one of our members on the LandAcademy.com online community. It’s free. This is a good question. Here’s what an option is. Can I answer this, Jill? Jack Butala: There’s a lot of things that … It’s called different things around the country, and depending on how old you are you may call it a dual escrow, or an option, or an option to purchase, or all kinds of stuff. They all add up to this, please retain this, this is the one thing you should get out of the show. An option is legal equitable title in a property. It doesn’t mean you own it, it doesn’t mean you paid for it, but you are now making decisions legally about this property, and you’re deciding how much you can sell it for, buy it for, and the whole thing. In lieu for getting that equitable title you usually give the buyer … You agree with the seller that he’s going to sell it, let’s say, for $1,000 and that you are going to market it, and he agrees to that maybe you pay him money, maybe you exchange signatures, but you get equitable title. Then you go market it. You lop it into all the other deals you’re doing, and you sell it for $5,000. Then the question here Jim’s asking is, “How do you close the deal?” That’s the background on an option. What we call an option. I can tell you how we do it, but our members now do it a lot of different ways, too. Maybe you can tell us. Jill DeWit: What do we do? Jack Butala: How we close an option deal. Then I call back my seller and say, “Yep. We’re good to go.” It can all happen on the same day. Jack Butala: It should happen on the same day. Jill DeWit: Exactly, and you do want to keep your name in the process, too, by the way, because we’re not realtors, we’re not representing other people, we’re actually buying it, so what’s going to happen is my buyer is going to put the $5,000 in my account basically. I’m going to turn around at the same time, put $1,000 in Mr. so and so’s account, or set up the cashier’s check for the notary close. However we’re doing it. Jack Butala: Or do it through escrow. Jill DeWit: Or do it through escrow. True. Jack Butala: You can do it with higher dollar properties. Jill DeWit: Exactly, and it’s all going to happen at the same time, so I guess what you’re asking … What I hear is that sounds like the right way for me to. You know, I don’t have the $1,000, but if I get the $5,000 I can try, and I can pay the $1,000. Is that okay? The answer is yes, and what are the chances of the seller … You just talked to him. That’s how you made sure you’re all still in, you know? Could he still change his mind? Yeah. You know, after the money comes … I mean, it’s really not going to happen, but if anything really, really weird happened you just refund it. Jack Butala: That’s exactly what I was going to say. Jill DeWit: I feel really bad, and by the way I have another one right here. Have you looked at this one? You know [crosstalk 00:04:27]. Jack Butala: There’s two things you want to remember about options deals that will keep you out of trouble forever. Number one, if something goes wrong make sure you have the money to give it all back. Number two, you want to take title. Not equitable title, actual title. You want to be in the chain of title as an owner for the 30 seconds that it takes the recorder to name … To record your deed and then record it in the new guy’s name. That makes you not a broker or an agent or a representative. It makes you an investor owner, and there’s nobody can say anything about it. All the way through this you want to be honest with every single person. That’s how the stuff goes sideways. We have a lot of very successful options people in our membership group, and it’s because of this, this tell the truth. Jack Butala: There’s one person in our group who says … Who says this sentence in the deal? “Hey, buyer, you’re paying 5,000 bucks for this thing. I want you to know I’m buying it for $1,000 from this guy over here. If for some reason that is now an unattractive scenario for you then let’s not do the deal, but I’m telling you this is an option deal, and I’m marketing it, and if you still see the value in the deal then we’ll go ahead.” You will never get in trouble that way, and it may kill your deal. The theory behind all these deals that we do is they’re smoking. Jill DeWit: I don’t do that. I’m like, my eyes are like, what? Jill DeWit: Do you know what’s so funny? Jack Butala: With you they just love you. Jill DeWit: Well they never ask. They just don’t ask, and I’m not going to … Well, let’s be honest, why would I volunteer unnecessary information? I’m not going to do that, and if they ask, “Do you own it?” I have equitable title. That’s what I say, and like you said you always be honest and up front, but you don’t need to offer extra information. It is a good deal because here’s the reality … Here’s the reality of what Jim should be with this whole situation. The guy that I’m … I’m buying it for $1,000. Jill DeWit: I’m selling it for $5,000. The guy who’s buying it from me knows it’s worth $10,000. Jack Butala: Oh, yeah, yeah. That’s why we’re all doing the deal anyway. Jill DeWit: That’s reality, and he’s all excited. Jill DeWit: He may or may not use it. He may be flipping it. Jack Butala: No, I agree with you, Jill. Jill DeWit: He may be building on it. Jack Butala: I totally agree. Jill DeWit: He may be giving it to a family member. Who knows? He’s excited, too. Jill DeWit: It’s still a good deal. Jack Butala: I will tell you this, here’s some good advice, if you’re going to go through escrow just add three zeros to what I just said, so you’re buying it for $100,000, you’re selling it for $500,000, and it’s worth $900,000. Now you’re going through escrow, and I’m going to tell you, people talk to escrow agent when they’re closing deals a lot. If you’re in this business you talk a lot. Escrow agents are awesome, by the way. Just great people in general, and it’s going to come out. If you’re doing a dual escrow every person involved in the transaction is going to know the economics after the third … This is the third time they talk to the escrow agent. Jill DeWit: What’s funny is, is that that’s not going to kill the deal. Jack Butala: I know. That’s what I’m saying. Jill DeWit: That’s what’s so interesting. Jack Butala: That’s what I say. Jill DeWit: People think that, “Okay, now I just killed the deal, and they’re going to go around sideways.” No, they’re not. Jack Butala: That’s my whole point, Jill. Jill DeWit: No, because how many times have you bought something, and you’re like, “You know, I know I can get in my car, I could drive over here, and I could save 10 bucks.” Am I going to go do that? Heck no. Jill DeWit: I’m standing right here. I want it. I feel good about it. Jack Butala: I got other stuff to do. Jack Butala: Yeah, so if you’re the kind of person who’s in the middle of that, and you’re the $500,000 person or the $5,000 person, and you can’t sleep at night because you know that I bought it for $1,000 or $100,000, and I’m making 400 grand on the deal, and it’s just eating you inside because you think you left money on the table, and that’s not how you do business then I will not sell this property to you. Jack Butala: I’m serious. That’s ridiculous. There’s huge value in sourcing deals like we do. Jack Butala: That’s what we teach. Jack Butala: Sourcing these transactions and getting there first. Jack Butala: Being the first person, so my point is this, there’s a lot of people who get upset about that. They have to negotiate, all right? That’s who they are. Jack Butala: That’s their culture. That’s their whole … They have to squeeze every single penny out of every single deal. That’s who we exactly do not do deals with. Jill DeWit: Well, you touched on something important. That mark up is your due diligence. There’s a reason why that person’s not doing it. They could go out and do this themselves, but they’re not going to. They’re choosing to pay for you to do the hard work. Jack Butala: Couldn’t agree more. Jill DeWit: Find them this great deal, then they’re still happy with it. Jack Butala: If I sound a little angry about this it’s because I am. Jill DeWit: I love it. If you have a question or you want to be on the show, reach out to either one of us on LandAcademy.com. Today’s topic, the meat of the show, assessed value pricing strategies that work. This is really for Jack. Jack Butala: Yeah. I wrote this title. On Monday and Tuesday we talked about … We alluded to the fact that this works in every single county. The variable is price. Well, how do you know how to price stuff? Like, there’s a big difference between, let’s say, sending out offers in northern Oregon versus sending out offers in central Arizona versus sending out offers for farm land in Iowa. Well, how do you know? In one of those states 100 bucks an acre might work really well. In one of those states 500 might work, and in one of those states 2,000 works. Well, how do you know that? This is what you do. You take a look at, for big picture 35,000 foot pricing, what’s active on the market, and what sold. There’s many places to get completed sales data and active sales data. There’s places that specialize in farm land. There’s places that specialize in acreage and rural real estate and land and the whole thing. Start with [LandPin.com 00:10:33]. There’s a ton of good comps on there. There’s completed sales comps on there. Start and go to Land Watch and some of the other places around the internet, and you’re going to see which of the three that I just described and where they fit. For the record, Iowa is the highest one. Oregon’s in the middle, and Arizona is the cheapest. I know that because I’ve been in the business for nine years, and you would know that if you just went to this … Spent 20 minutes on the internet and took a look. Jill DeWit: Did some due diligence. Jack Butala: Assessed value comes into play, so now you know that the basic pricing is what it is. Assessed value comes into play as a relativity variable within that county. I know that sounds crazy and complicated, but I’m going to explain it. It’s very simple. All the property that you’re looking at in a county in Iowa that you want to spend a couple thousand bucks an acre on or more, maybe 4,000, is going to have different assessed values. Let’s say you look at all the 10 acre little micro farms in Iowa. Let’s use 40 acres because some people do still have 40 acre farms. In the universe of XYZ County in Iowa there will be super high assessed 40 acre properties and super low assessed 40 acre properties. That’s how you gauge the exact offer that you’re going to make. Not the dollar amount of the assessed value. You formulate a type of equation based on it, so maybe at the top of the scale for assessed value it’s $40,000 or $400,000, and the bottom of the scale is zero. You use that assessed value as a … See, the assessor … There are assessed values because that’s how the assessor knows what to send tax bills out for. Jack Butala: Theoretically the assessor’s done all the work for you. He or she said, “Well, this farm is only worth this in it’s low end, so we’re going to tax bill for this. Oh, but this farm’s worth this.” For whatever reason they think that. We don’t know or care. They’ve already done all the work, and that’s how you sort of loosely base your variable pricing. If you’re going to send a mailer out to Iowa, let’s say, you start on the relativity assessed scale, and you start, let’s say, at 2,000 an acre and go all the way up to wherever you’re comfortable capping it. Maybe it’s 4,000, maybe it’s 4,500, maybe it’s 6,000. Jill DeWit: It’s so interesting, Jack. I want to ask some questions here. Jill DeWit: It doesn’t make sense, but, you know, why they assess this property at that rate can be so different to than what it’s really, really worth, A, so I want to know if you would share a little more on that. Then B, boy, I wish the counties could all work together and do this similar, but they don’t. That’s a whole nother thing even within the same state. Jack Butala: There’s an economic theory out there, and I don’t want to get too philosophical, the gist of it is this, where there’s market volatility there’s money to be made. You just got to be smart enough to get on the right side of it. That’s what this is, so if every county did it exactly the same like communist Russia. Jack Butala: Where you can’t own property anyway. Jack Butala: If it was like that, and it was all super organized there would be no volatility and no money to be made. This nebulous, variance that drives some of our members nuts. Jack Butala: It drives them nuts. Well, why can’t you just tell me exactly what to offer? What is the equation? These are questions I get all the time. Jill DeWit: We’re day trading property. Jack Butala: Why can’t you just tell me that if it’s assessed at $3,000 then I should be offering $4,500, and if assessed … Give me the exact equation. I want to send out my mailers. I want to send out my mailers. Jill DeWit: Exactly. That was perfect. Jack Butala: That’s just not how it works. Jill DeWit: It’s so perfect. Jack Butala: Tiny little forward step. Assessed value is only the way you gauge the relativity within the county that you’re working. Jill DeWit: As I’m learning a new county, Jack, gosh should I download all that extra data to figure out where the top and the bottom is? Jack Butala: There’s two ways to do that, and that’s a great question. Jack Butala: I’ll tell you what I do. I download it all because it’s eight cents a record. The extra 500 or 600 or 700 records adds up to virtually nothing. Jill DeWit: In the scheme of things. Jack Butala: We spend an extra 200 or 300 bucks on the data to avoid spending $3,000 or $4,000 extra on the mailer. Jack Butala: It costs 50 cents a stamp. You want to avoid that. Jill DeWit: Right, that’s eight cents cheaper. Jack Butala: For eight or 10 cents depending on when you join our group, that’s a lot cheaper. Jack Butala: Silly cheaper. Plus, if the mailer works, and if you’re at this level it’s going to work, you’re going to use that extra data next time anyway. Jill DeWit: Right. Well, let me ask this, will this hold true in the other sizes? Let’s just say, Jack, I’m new, and I downloaded all the five acre properties in this county, and I’m doing exactly what you said, and I found the sweet spot. Now, do I have do the same thing at the 10 acre level, or can I kind of gauge … It’s there same assessor who’s assessing the five acres, the 10 acres, the 20 acres. Does my formula that I created traditionally hold true? Jack Butala: It does. However, there is a slight variable, and it’s this … That’s smart, Jill. Jack Butala: The higher you get in acreage, the higher the dollar amount, right? If you wrote an equation for all the five acre properties, and let’s say for sake of argument it’s 1,000 bucks, so you want to spend $5,000 on a five acre property. That’s five times 1,000. Jack Butala: Then as it goes up you start … Maybe you want to spend $999 at 5.02, 5.04, and on and on, because the larger the property the dollar amounts start to get really crazy. You got to be careful on the sales side. You want to go in a little bit low. I’ve repriced it that way just like that. This guy was shooting for the moon. He’s going to kill it. He’s going to knock it out of the park. He’s going for 200, 300 acre properties in Texas. Jack Butala: In two specific counties for whatever reason made sense to him, and if they make sense after looking at it now, and that’s what I did for him, because he was at … At the 240 acre level he was at 24,000 bucks. 100 bucks an acre. I know from experience at that dollar amount when an owner who is willing to sell receives that in the mail, if it’s 24,000 or if it’s 18,000 or 16,000 or 15,000 they’re going to sign it no matter what. Jack Butala: They decided they want to sell it. Jill DeWit: North of 15,000 or whatever it is. Jill DeWit: North of whatever, they’re okay. Jack Butala: Right, so you might miss one deal by doing it that way, but you’re going to do way more deals. Jack Butala: To answer your question, it’s not exactly apples to apples, but it’s darn close. Jill DeWit: Okay. Starting off, if I stick with five and then I go to 10, if I stay in the same range then I’m good. Jill DeWit: I’m talking acres. Jill DeWit: Yeah, I don’t go from five acres to 160 acres. Jill DeWit: And use the same formula. No. Jill DeWit: From five acres properties to 10 acre properties it’s going to be pretty close. Jack Butala: The other thing that I’m seeing, too, is that … To drive this point home, so let’s say you did spend 200 or 300 bucks more to get all the data for five acre properties in the county, and you send it in on the lower end and then you get a response, you do by 5%, 1% to 5% of the number that you sent out. The next thing you should do is don’t go buy anymore data. The extra data that you used to gauge the numbers, kick it up a little bit. Jill DeWit: Send those guys offers. Jack Butala: You’re also going to have six or seven buyers in your back pocket because they want to buy your property in that area that you just ran out. You ran out a property. Jill DeWit: Exactly. Now, circle back around, and use that data. The next level up you didn’t offer. Jack Butala: We have some members who start in two counties like that, and they never leave the rest of their career. Why would you? Jill DeWit: Well, you get to know people. Exactly. You know the area. You could be the expert in XYZ area. Jack Butala: I was just going to say that. Jack Butala: In six months they’re the expert now. Jill DeWit: Totally. There’s nothing wrong with that. Jill DeWit: Good. Well, thank you, Jack. Jack Butala: We have a member in Indiana that’s knocking it out of the park in northern Indiana. This exact concept. Jill DeWit: That’s awesome. Cool. Join us in another episode where Jack and Jill discuss how to use information. That’s Jack. Jill DeWit: Inspiration, that’s me, to get just about anything you want. Jack Butala: We use it every day to buy property for half of what it’s worth and sell it immediately. Jill DeWit: It’s kind of fun for me, too. I like changing roles like that. Jill DeWit: I just thought of that, too. Whoops. Jack Butala: Maybe we should exchange underwear sometime. Jill DeWit: Wait a minute. Jack Butala: So how it feels. Jill DeWit: Yikes. Let’s not go there. Although, I wouldn’t mind seeing that. Let’s go. Jack Butala: That’s not something we’re going to film at all. Jill DeWit: No, no, no, no, no, no. All right. Jack Butala: We’ll probably never talk about it again. Jill DeWit: Okay. Information and inspiration to buy undervalued property.